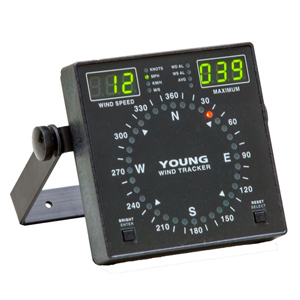 The 200-06201 Wind Tracker Display is a compact wind speed and wind direction indicator. Wind speed is displayed in your choice of units, knots, mph, km/h, m/s. Maximum wind speed is saved on the display until reset by the operator. Wind direction information is clearly displayed on a circular compass pattern of LEDs. The 200-06206 Marine Wind Tracker indicates wind angle relative to vessel heading. The 200-06201 Wind Tracker wind speed and wind direction indicator offers big performance in a compact display. 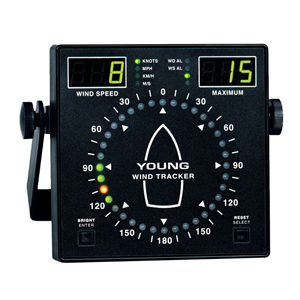 Wind speed is displayed in your choice of units, knots, mph, km/h, m/s. Maximum wind speed is saved on the display until reset by the operator. Wind direction information is clearly displayed on a circular compass pattern of LEDs. Multicolored segments give a quick visual indication of current direction and direction variability. Real-time or averaged data can be displayed. The 200-06206 Marine Wind Tracker indicates wind angle relative to vessel heading. Front panel brightness control allows adjustment for best viewing in any light. A variety of wind sensors are supported. Standard outputs are 0-5 Vdc and RS485 for additional displays. Alarms for both wind speed and wind direction are provided. The Wind Tracker is very compact. Face size is 144 mm x 144 mm to fit standard DIN panel configurations. Depth is 36 mm for easy mounting on vertical bulkheads or wall surfaces. 12-30 Vdc power enables the Wind Tracker to be powered by external batteries or AC wall adapter (included).